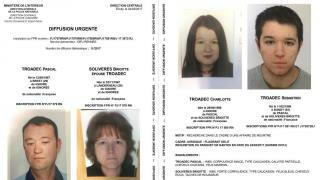 (Newser) – France has been transfixed by the mysterious disappearance of a family of four near Nantes. Parents Pascal and Brigitte Troadec, both around 50, and children Sebastien, 21, and Charlotte, 18, have not been seen since Feb. 16, the BBC reports. Bloodstains—and evidence of attempts to wipe them away—were found throughout the home, investigators say. Beds in the home had been stripped, and there were no toothbrushes or hairbrushes to be found. With food in the fridge and wet clothes in the washing machine, "it's as if the life of the house was frozen in time," says prosecutor Pierre Sennès. Oooh, head this one before. 18 year girl is unable to date the older man she wants so her and the bf kills both parents and the brother happens to walking in so they kill him also. i win!!! They are all very unappealing in the looks department.